I love making beautiful things and I love sharing them even more! Here you'll find original craft tutorials and views of my life as a stationery designer and small business owner. Click here to read more. 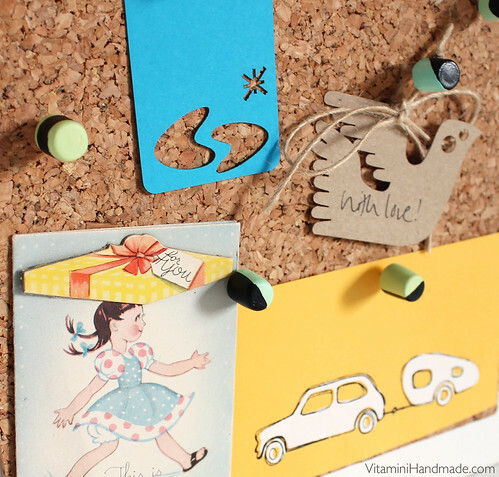 Vitamini Handmade contains advertising and affiliate marketing links. If a purchase is made via one of these links I may receive a small commission from that purchase. That said, I only link to items that I use and love. Thanks for supporting the brands that support this blog! How to plan and hang a gallery wall. Love one of my projects and want to share? You're welcome to share one of my images on your site, provided it's credited and linked back to the original post. Full tutorial content and multiple images are not to be redistributed. All content and images © Casey Starks | Vitamini Handmade 2015 unless otherwise noted. Pushpins. Use up those mis-matched ones you already have. Where did that single yellow one come from, anyway? 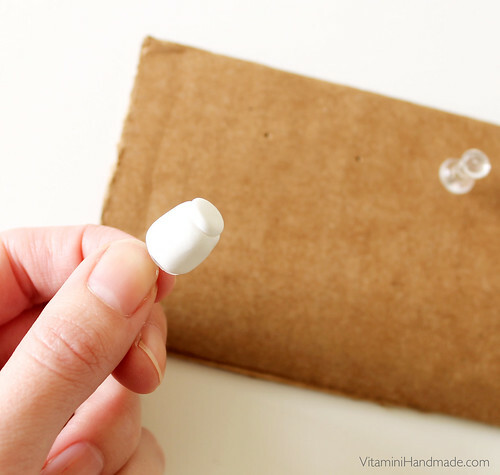 Start by making spaced-out holes in the cardboard with a pushpin. Make one hole for each pin. 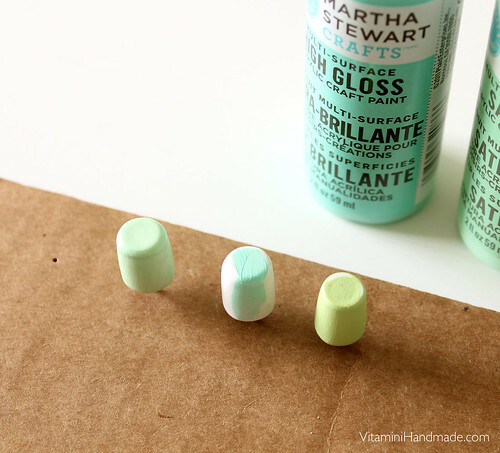 Pull off a small piece of Fimo from the block. Soften it in your hands and roll out a little ball and a long flattened piece (technical terms, people). Roll the flattened piece around the pushpin, removing any excess that overlaps too much. Roll it between your fingers to smooth it out around the pin. Flatten the ball a little, and add it to the top. Work it between your fingers until it's smooth and the seams disappear. Carefully put it into your cardboard rack in one of the holes you made earlier. Repeat until your rack is full (or your cup runneth over, whichever comes first). When your pieces are cool, paint them with the light color. Just leave them on the rack and paint around them. Add the black accents. Paint just the middle, or just the top, or try an angled, dipped look. Make a bunch! Let them dry, and done! A set of these would be a nice gift for a coworker. Make them in her favorite colors! I think these bad boys will really class-up my cork board. I'm off to go make some more! Have a wonderful weekend! 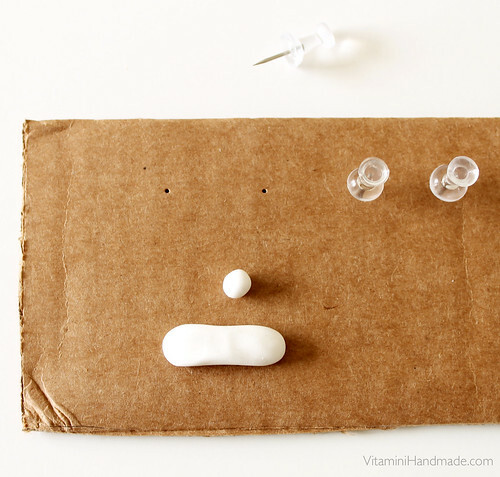 This is a great idea, I too have those plain plastic push pins and was thinking of how to make them more chic and this is a great solution. Thanks Casey I will be trying this soon. Cool! Let me know how they turn out! what a brilliant idea! you could even try and make different shapes.